I used to be ignorant about the "Cancer Loophole." I thought that if a product was on the store shelf, that meant it was safe. I naively believed that if a product contained dangerous, toxic ingredients - ingredients that could cause cancer - that the product would be banned. But I've learned something over the past five years while making a documentary: companies don't need to disclose whether a product contains chemicals that cause cancer or disrupt hormones - even chemicals that could interfere with a child's growth, or cause reproductive problems. Even pink ribbon products, which are ubiquitous during Breast Cancer Awareness Month, might contain carcinogens. That's right: the product you are buying because you think a portion of the proceeds go to "cure" cancer might contain chemicals that could "cause" cancer. When I found out about this outrageous Cancer Loophole, I was angry because it hit so close to home. Seven years ago, my wife Heather died of cancer. Our daughters were 2 and 5 at the time. Heather was the one who conscientiously watched over the products that came into our home. Now, it is up to me to keep my girls healthy. That was a promise I made to Heather, and I am doing my best to honor that promise. At first, I didn't understand why a company would make a product that was toxic. Why would anyone do that? Then I learned why: it is cheap to use toxic petrochemicals, and expensive to reformulate products so they aren't toxic. Removing a carcinogen or hormone disruptor from a shampoo, or fragrance, or pajamas, or lipstick, or laundry detergent, and replacing it with a safer chemical is expensive. "Too expensive," say the manufacturers, and so far, our federal government hasn't found a way to force them to take out the toxins. While in Europe, nearly 1,400 chemicals that cause cancer and birth defects and disrupt hormones are banned from consumer products. In America, we restrict only 11 ingredients. That's right: 1,400 in Europe and 11 in the U.S. In fact, for this reason most multinational corporations sell different versions of their products in the U.S. and in Europe. The American version is cheaper to make and has higher profit margins. To make matters worse, companies don't have to disclose dangerous chemicals on product labels. Why don't companies want us to know all the ingredients that go into their products? The answer is simple: they're afraid of losing a sale. If you knew there were toxic chemicals in something you bought every day, you would stop buying it. And that's why I made a documentary called "Stink! ", because no one should be ignorant about the Cancer Loophole. I mean, can we all agree that American consumers should have the right to choose whether they want to be exposed to chemicals that cause cancer, or birth defects, or reproductive harm? Apparently not. Our elected officials need to hear from the public on this right now. Our voices are being drowned out by a very powerful industry and its lobbyists, both in Congress and in our statehouses. And only a groundswell of public anger will bring about a change in the law, so that we can get the most toxic chemicals off the market and out of our products, and get all ingredients disclosed on product labels. So, as we enter International Breast National Cancer Awareness Month, I leave you with this: Congress needs to close the Cancer Loophole. If Congress passed a law that made companies disclose all carcinogens on product labels, we would have more informed consumers, safer products, and most importantly: less cancer. 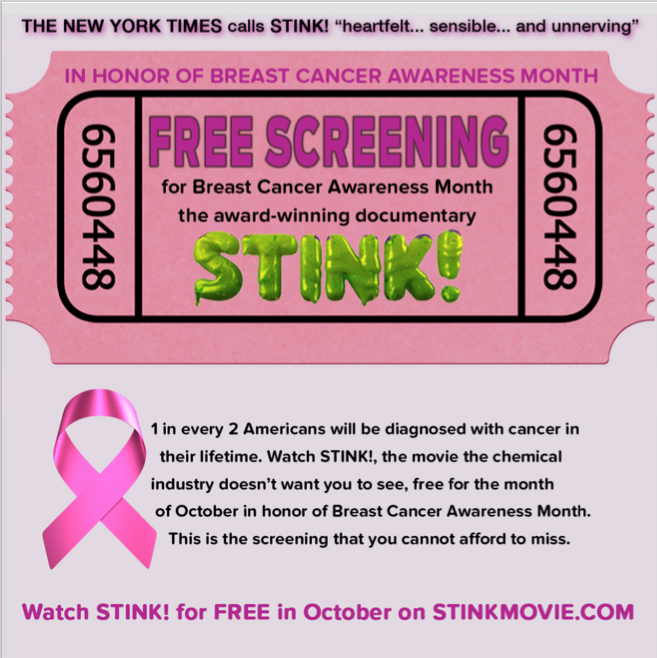 To honor Breast Cancer Awareness Month, the award-winning documentary "Stink!" 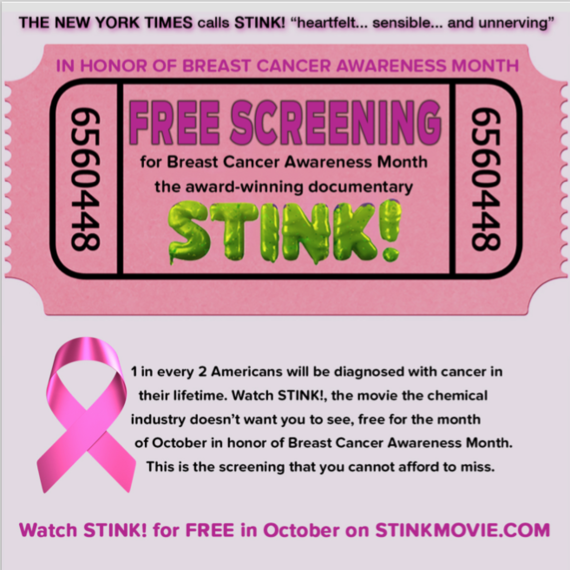 will be free to the public for the entire month of October 2016 on its website, StinkMovie.com.